In our blog article Part I: The Missing Link in Current Quality Measures, we discuss how the pressure to check off quality assurance/improvement measures can cause a system or provider to inadvertently eschew a patient-centered approach and miss the mark in their quest to provide quality care. In this segment, we discuss these dynamics in more detail, and provide solutions for how a healthcare organization can meet quality standards while still building rapport and engaging the patient in their self-care. In addition, there is ample evidence that one of the strongest impacts on both patient satisfaction and clinical outcomes is the care provider’s interaction with the patient – one that emulates a caring, empathetic partner with the goal of empowering the individual to take charge of one’s health.3-5 And yet, traditionally, our current quality improvement measures do not effectively support such an approach. Another example is how we initially interact with patients. Although the acquisition of effective communication skills to support a Patient Medical Home is emphasized by national accreditation programs, most care management organizations/departments have long, tedious intake questionnaires with closed questions that staff are required to administer during a first patient encounter. Not only does this approach reduce initial engagement and rapport-building, it lowers the odds of getting the patient on the phone for a second session as the first session did not feel beneficial from the patient’s perspective. One last example is what we reinforce (or fail to) through our quality measures and performance evaluations. Although the gold standard for evaluating effective patient engagement skills is using a standardized, validated tool to code or assess a recorded patient session,7-9 current performance evaluations and quality assurance measures almost completely rely on the completion of assessment forms, checklists, and proper documentation. It is only in rare cases that a clinician is evaluated on evidence-based communication skills, with concrete feedback based on an actual patient session. 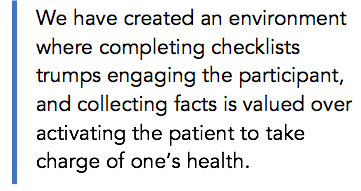 Essentially, what slowly evolves is an environment where completing checklists trumps engaging the participant, and collecting facts is valued over activating the patient to take charge of one’s health. There are ways to achieve quality standards while still maintaining a patient-centered approach. An extension to the above is to build in representation of the patient’s voice across all policies and procedures. One way of doing this is to form an internal patient advocacy group that is comprised of both staff and patients. (Note: this is a different framework than the typical patient advocacy representative who steps in when there is a conflict; e.g. a hospital employee who works for the Risk Management Department.) Alternatively, there are external consultants that specialize in patient engagement that can perform a relatively quick scan of your policies, procedures, workflow, etc. and provide you with strengths and areas that need improvement. Modify patient assessment forms from a questionnaire of multiple close-ended questions to a process that gathers the same information but in a more semi-structured exploratory interview format. 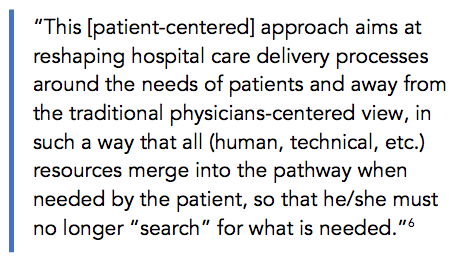 If this is not feasible, at least build in prompts and cues to remind staff how to gather the information needed in a more patient-centered approach; i.e., open questions, reflective listening, affirming, partnering. Relax guidelines that requests all facts be gathered during the first session, and trust that sub sequent rapport-building will ensure a second session. Modify documentation template to collect data that represents best practice in behavior change science. For example, numerous studies have supported the causal link between the evocation and reflection of “change talk” from the patient with increased commitment to the treatment plan and subsequent positive clinical outcomes.15-19 Therefore, it makes sense to document examples of change talk verbalized by the patient during the clinical encounter, as well as commitment strength voiced at the end of the session to following through on next steps that the patient has identified. 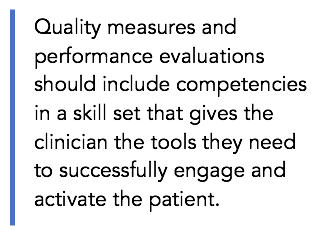 Change quality measures and performance evaluations to include competencies in a skill set that gives the clinician the tools they need to successfully engage and activate the patient. Just as we expect clinicians to demonstrate proficient clinical skills, with adequate training and support, we should expect them to also demonstrate proficient health coaching skills if that is their role in the organization. There are varying levels of proficiency that can be set for different roles, from a “do no harm” initial level for reception staff to health coach expert level for care managers. When management takes a more robust approach to aligning with their quality efforts with a sustained and substantial commitment to a patient-centered approach, it is woven through all levels of quality improvement standards. Rather than disrupt the workflow, building and using effective communication skills not only enhances patient engagement, it enables staff to collect more relevant and accurate data. In addition, using patient-centered processes lays the foundation for having a better chance of activating the patient to take charge of one’s health. In turn, this engagement and activation improves adherence to the treatment plan and clinical outcomes – all good news for your quality standards. 1 Bodenheimer T. Coordinating Care – A Perilous Journey through the Health Care System. N Engl J Med 2008;358(10):1064-1071. 2 Goldzweig CL, Orshansky G, Paige NM, et al. Electronic Patient Portals: Evidence on Health Outcomes, Satisfaction, Efficiency, and Attitudes: A Systematic Review. Ann Int Med 2013;159(10):677-687. 4 Manary MP, Boulding W, Staelin R, Glickman SW. The Patient Experience and Health Outcomes. N Engl J Med 2013;368:201-203. 5 Johnson DM, Russell RS. SEM of Service Quality to Predict Overall Patient Satisfaction in Medical Clinics: A Case Study. Qual Manag J 2015;22(4):18–36. 10 Pomey MP, Hihat H, Khalifa M, Lebel P, et al. Patient partnership in quality improvement of healthcare services: Patients’ inputs and challenges faced. Pat Exp J 2015;2(1):39-42. 11 Butterworth SW, Linden A, McClay W. Health Coaching as an Intervention in Health Management Programs. Disease Management & Health Outcomes 2007;15(5):299-30. 12 Noordman J, van der Weijden T, van Dulmen S. Communication–related behavior change techniques used in face-to-face lifestyle interventions in primary care: a systematic review of the literature. Patient Educ Couns 2012;89(2):227-44. 13 Olsen JM, Nesbitt BJ. Health Coaching to Improve Healthy Lifestyle Behaviors: An Integrative Review. American Journal of Health Promotion 2010;25(1):e1-e12. 14 Wolever RQ, Simmons LA, Sforzo GA, et al. A Systematic Review of the Literature on Health and Wellness Coaching: Defining a Key Behavioral intervention in Healthcare. Globl Adv Health Med 2013;2(4):38-57. 15 Barnett E, Moyers TB, Sussman S, et al. From counselor skill to decreased marijuana use: Does change talk matter? J Subst Abuse Treat 2014;46(4):498-505. 16 Perry CK, Butterworth SW. Commitment strength in motivational interviewing and movement in exercise stage of change in women. J Amer Acad Nurse Pract 2011;23(9):509-514. 17 Moyers TB, Martin T, Christopher PJ, Houck JM, Tonigan JS, Amrhein PC. Client Language as a Mediator of Motivational Interviewing Efficacy: Where Is the Evidence? Alcohol Clin Exp Res 2007;31(s3). 18 Houck JM, Moyers TB, Tesche CD. Through a glass darkly: Some insights on change talk via magnetoencephalography. Psychol Addict Behav 2013;27(2):489-500. 19 Glynn LH, Moyers TB. Chasing change talk: The clinician's role in evoking client language about change. J Subst Abuse Treat 2010;39(1):65-70.